it was in pretty good shape on arrival but a total strip down, clean and polish and fit new bridge n flats. no need to replace the pickups, they sound very good. 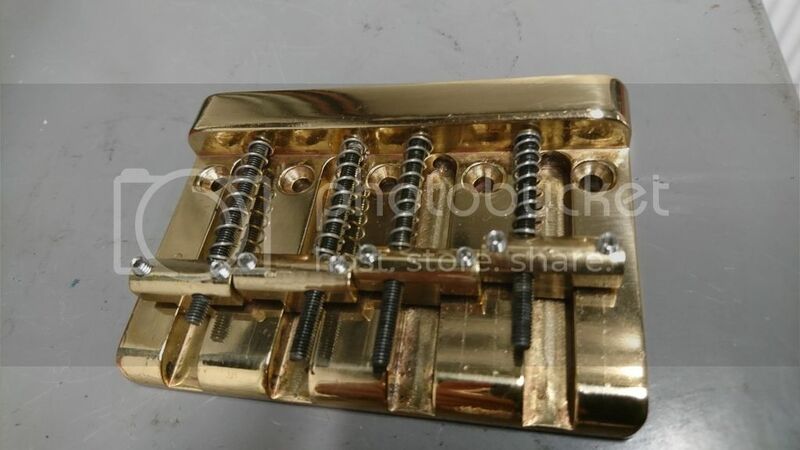 The original brass bridge was badly corroded but is responding well to cleaning, it may yet go back on as the Hipshot is though excellent not the perfect match for the body. These are great basses with great pickups,I have one too,congratulations! thanks for that. the original bridge is done and ready to go back on but that will probably later or never. I'll link a pic soon. The bridge was cleaned but not enough to make it look brand new. new stainless grub screws and I also made some stainless springs to go with the original intonation screws. And a final thin coat of clock varnish. Yes I have spotted that the intonation screws are in the incorrect order, I am currently looking for some stainless versions.